Since Mother’s Day is creeping up on us (Sunday, May 12th), I thought I would show some gift ideas of things that I love and also give as gifts. I think soothing gifts are always nice because moms are so busy taking care of the kids, they never have time to slow down. A spa treatment is a great present — it gives Mom an afternoon on her own to indulge in ultimate relaxation. 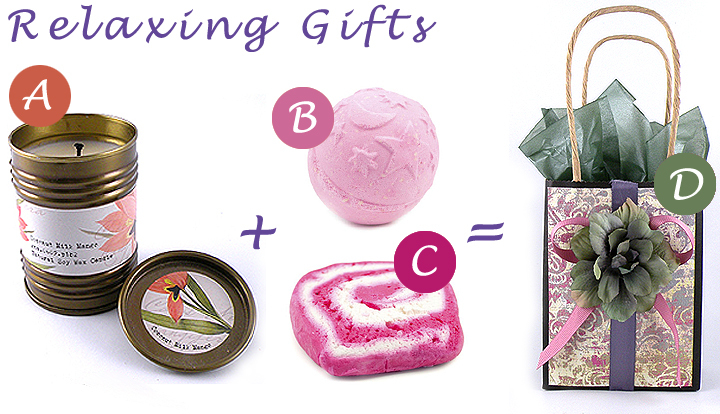 You could also give her some of these spa-inspired relaxation gifts so she can pamper herself at home. This soy based candle smells so delicious, I just want to eat it. I give these candles as gifts all the time and everyone asks me where I bought them because they want to get more. I also love the Avocado Mint scent. These handmade bath bombs have an amazing scent for the ultimate bath experience. They are a bit pricey so I cut mine in half to get more value out of them. Lush has a large selection of bath bombs and fragrances to suit every mood. I love the scent of this bubble bar — I call it a jello bath because it is more of a fruity, black currant scent and reminds me of the Jello flavor I make for the kids. Just break off a small piece of the bar and crumble it into running water for an unbelievable display of purplish-pink bubbles to soothe away the day. Create this easy to make gift bag to hold your relaxing Mother’s Day gifts — it is sure to bring a smile to her face. I believe that presentation is a big part of the gift. Nothing is more soothing to me than a warm cup of tea after a long day. This tea maker looks like something that would be found in a mad scientist’s laboratory, but it actually steeps the perfect tea. 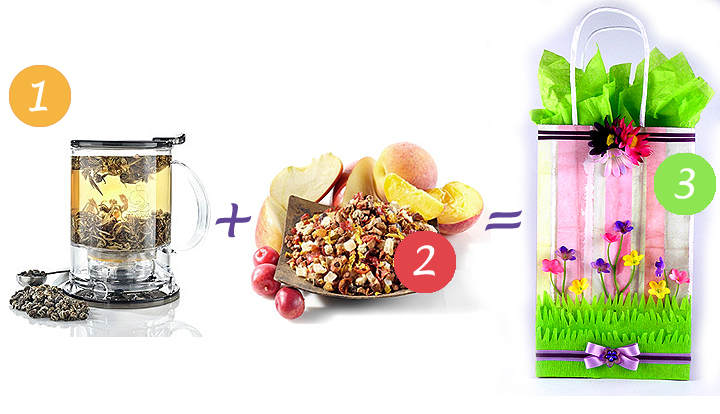 I love tea with peach flavors — I drink a least one cup of peach, ginger green tea a day. This tea is a fancy version of the type I get from the grocery store. It is a calming blend of peach and citrus. There a so many tea blends at Teavana so test them out to find the perfect one for the tea drinking mother in your life. Here is another one of my easy to create gift bag designs that is a pretty way to give your Mother’s Day gifts. This would be especially nice for a mother who loves her flower garden. This entry was posted in Gift Wrapping, gifts, mother, Mother's Day and tagged anthroplogie, bath bars, bubble bath, candles, Gina Tepper, lush, Mother’s Day, mother’s day gifts, relaxation gifts, soothing gifts, spa gifts, spa treatment, tea, teavana. Bookmark the permalink.